ATHA (Association of Traditional Hooking Artists) is an international fellowship of artists that fosters individuality and diversity in rug hooking. ATHA stands for the combined talents, creative energy and resources of over 4,000 fiber artists across the globe; and exists to help people express themselves through fiber art. Let ATHA start you on your personal creative journey today...ATHA leads the way in providing resources across the globe for everyone who has an interest in rug hooking—whether you just pulled your first loop or have been rug hooking for years. We truly believe the creativity of our members with their broad and diverse experience will inspire you. This creative energy is what keeps ATHA members abreast of the latest ideas and resources available for this art form. This large pool of resources gives everyone the tools they need to be a part of this grand tradition of self-expression. With over 4,000 members, most likely there is an ATHA chapter or member in your community! Creative community is the most unique and greatest benefit of ATHA membership. This opportunity is to be a part of a local ATHA chapter near you. Over 70+ ATHA chapters are in existence today and more are being started all the time. The chapters form this creative community by having regular meetings, special programs, educational resources, public shows and hook-ins. Check the map on this page and see if there is an ATHA Chapter near you. 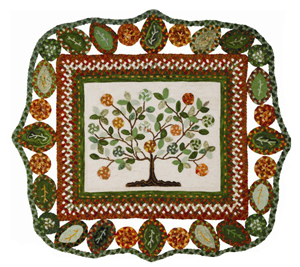 Once you become a part of the ATHA community, you will be amazed at the wealth of information and encouragement each ATHA chapter and the magazine, Art of Rug Hooking provides its members. We hope you will attend a local ATHA meeting in your community so you can experience firsthand the creative talents of our members. If there is not an ATHA chapter in your area, that does not mean you cannot be a part of this exciting community. By joining ATHA, you become a part of the worldwide ATHA community and get the bimonthly magazine, Art of Rug Hooking and can connect with members worldwide. ATHA is the Association of Traditional Hooking Artists. . . Join Us and Get Hooked! Click Here to read about the history of ATHA.